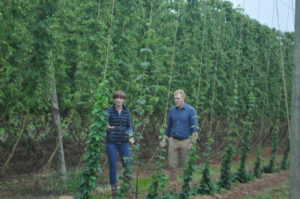 In September 2018 during the hop harvest, Countryfile visited The Cappers, one of the 57 British Hop growers at Stocks Farm on the border of Herefordshire and Worcestershire. Take a look at Adam Henson harvesting Endeavour hops, seeing the whole harvest process from start to finish, learning about green hops and brewing green hop beer in the onsite brewery “The Hop Shed”. Click here and fast forward to 31 mins and 8 secs to see the clip.